A series devoted to dishes that make life feel a little more effortless. We partnered with Pacific Sales—that place where every slick kitchen brand you’ve ever coveted lives—to discover the ins-and-outs of how chefs entertain at home. Their rituals, their styling tips, and above all: recipes for the dishes they use to impress their favorite guests. For chef Makani Carzino of Pono Burger, passion fruit is among her earliest memories of food. It embodies everything she loves about her native Hawaii, with its bright, pure ingredients and meditative preparations. 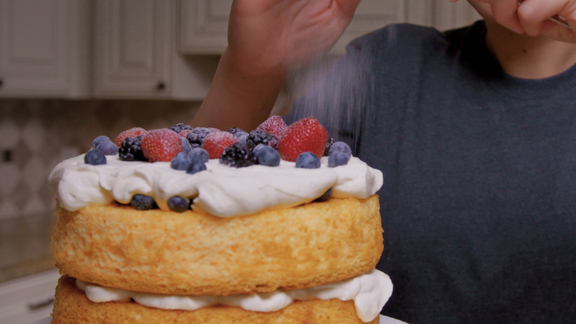 Her simple, stunning dessert might be the closest your guests come to cleansing their palates with an actual cloud. The easiest showstopper in your arsenal. Zack Hall of Clark Street Bread never thought he’d be one of the most in-demand bakers in Los Angeles; he dreamt of guitar licks, not bread dough. We like to think his riffs on the ultimate comfort food classic—grilled cheese—are the sandwich version of a face-melting guitar solo. Life is funny that way. If satisfaction is what you’re after, look no further than ribeye. When that serious marbling meets a screaming hot pan, the resulting depth of flavor is the kind of thing that makes the whole table go quiet. Serve it with a homey trio of mushrooms, onion, and potatoes like Otium chef Tim Hollingsworth, and you’ll remember exactly why they call it a classic. Steak à la Timothy Hollingsworth.